Anne of Green Gables is one of my all time favorite stories. I can’t tell you how many times I’ve watched the film version starring Megan Follows. Green Gables Knits listed on Ravelry is a beautiful collection of knit patterns inspired by the book. If I were a better knitter, I would love to own this book – the patterns look like such fun! 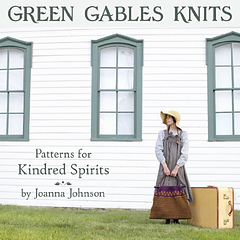 The author, Joanna Johnson, really did an amazing job of designing patterns that captured the beauty and timelessness of the story. The book comes with 8 patterns and they can all be viewed on the book’s Ravelry page. I like all of them, but my favorites are Anne’s Sweater, Gilbert’s Scarf and Diana’s Hat. Inspired by the beloved children’s classic, Anne of Green Gables, this collection of eight patterns includes knits for ages 12 to adult and includes garments and accessories for teens, women, and men. Each pattern is accompanied by quotes from the novel alongside a selection of L. M. Montgomery’s personal photographs from Prince Edward Island. This work is published in collaboration with The Heirs of L. M. Montgomery, Inc.
Green Gables Knits is available at your local yarn shop, our Etsy shop, and Amazon.com. I enjoyed Anne of Green Gables too. I think you are a good knitter!